Glaeser, Gottlieb, and Ziv have a economics working paper in NBER (not Open Access, unfortunately) in which they report their assessment of the happiness of various cities across the US. Vox has a nice map which makes the point pretty well, but I had to grab the data and take a look for myself. 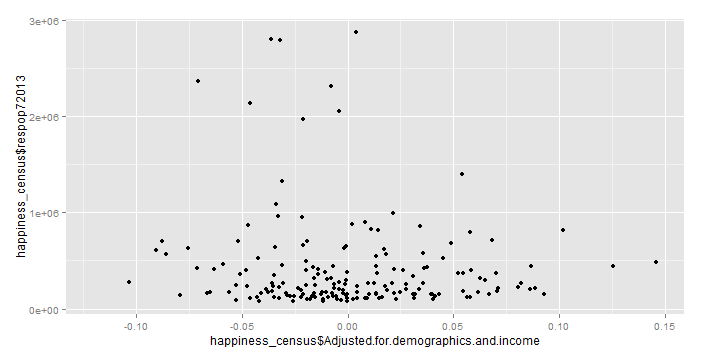 I got population data from the US Census website and, happily, the happiness study used the same metropolitan statistical area names as the census does, so it was a simple merge to visualize population vs. happiness. Here’s the cleaned and merged data and the R script I used if you want to play along. Source data is available from the US census page and Gottlieb’s web site. I also scraped some data as necessary from other places, as documented in the script. There are numerous possible explanations, but I’m going to tell you my favorite one, which is that there is a negative correlation between population density and happiness, mostly due to the friction associated with activities of daily life in a large city. If you look in more detail at the locations of the 293 incorporated areas with more than 100k people, there are only two places where high population density and happiness occur together: Santa Clara County in California and Denton County in Texas. Overall, it’s rare to see a populous city in a happy area. Look at Orange and LA counties, the Seattle area, around the Great Lakes, and the Northeast, for example. 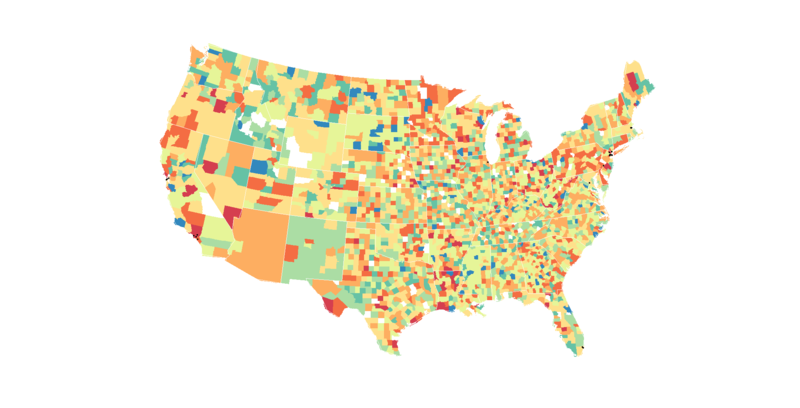 Interestingly, the two happy counties with 100k+ people are near the highest density areas for their region. Santa Clara has the tech suburbs of Mountain View (my city!) and is near San Francisco. Likewise, Denton is outside Dallas. It’s tempting to think the residents of those areas formerly lived in the more dense areas until they could afford to make their escape. It’s hard to see the points for the cities and I don’t know how to do alpha transparency with base graphics, so you’ll need to click through to the full-size images to see the points for the cities. I plotted the 20 highest density cities on this map. None were in an area which scored above zero on the happiness index. When you look at the least dense cities on the list, the picture is a little different. There are a few cities in areas with a positive happiness index. Of course, correlation isn’t causation. It could be that people seek out cities for the income potential and not the quality of life, that the more success-driven people collect in cities, and more success-driven people might be less happy at any given moment because they’re always working towards something bigger and better. It might also be that close proximity with your fellow man elicits more comparison of yourself to other people and the attendant insecurity that can create, or just creates more despair for humankind. Since the only positively happy cities in the 1 million+ group were both in Florida, it might also be interesting to look at the annual amount of sunshine each place gets. Overall, it’s striking how happiness takes a dive in cities compared to less populated areas. my website is mechanical Engineering related and one of best site .i hope you are like my website .one vista and plzz checkout my site thank you, sir.